In 2016, it's time to revamp your mobile app strategy. It’s no longer enough to target mobile customers based on bare-bones demographics. Now you need to understand who your customers are by segmenting them based on in-app behaviors. This includes their interests, activities, and even the times of day they’re most likely to interact with your business. 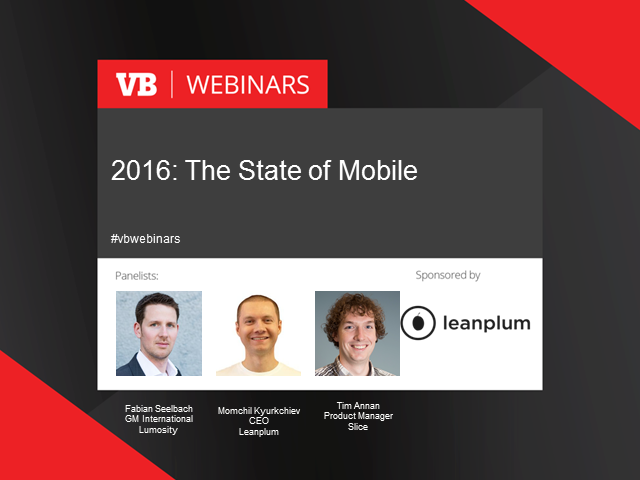 To kick off new year, we’re laying down the law in The State of Mobile 2016. Alongside top mobile brands, we will analyze key learnings from the past year — the strategies that succeeded and the surprises that didn't. Next, our speakers share their biggest mobile secrets, including predictions and plans for the rest of the year. These real-life case studies will help inform your 2016 mobile marketing strategy. Get the inside scoop on leading mobile marketing automation strategies, with insights on from the biggest brands on driving maximum growth all year long. Register today!